Krug is in a league of its own. Of all the big boys in Champagne, I have to say that this is my favorite. Always muscular, but feminine at the same time. Everytime I drink Krug, there is just something so Krug about it. 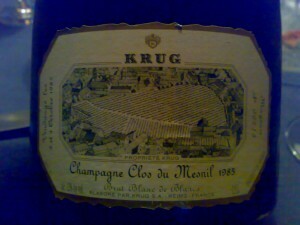 If you have tasted Krug, you know what I mean. If you haven’t, then you need to go and find out. Founded in 1843 by Johann-Joseph, Krug is a Négociant-Manipulant (they source the majority of their grapes rather than growing them) located in Reims in the Montagne de Reims. They own 19ha of their own vineyards, and buy in top quality grapes from around 56ha. Krug remains one of the few Houses in Champagne to ferment in small oak barrels. They don’t practice malolactic fermentation (the fermentation that converts the natural occuring, tart tasting malic-acid to a softer tasting lactic-acid), and they utilize extended lees aging of 6-8 years even for their “basic” Grande Cuvée. They don’t filter their wines. Annual production is around 500,000 bottles. 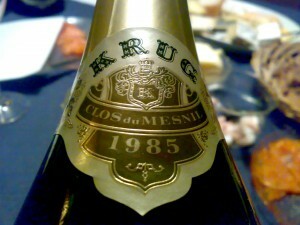 The Clos du Mesnil is an exception to the Krug rule of blending. This wine is 100% Chardonnay from the renowned Clos du Mesnil vineyard within the village of Mesnil-sur-Oger in the Côtes de Blancs. This historic 1.85ha vineyard has been enclosed by a stone wall since 1698 and is set on a southeast-facing slope and is sheltered from the weather by its wall and surrounding houses. This vineyard was purchased by the Krug family in 1971 and started to carefully restore the vineyard to its previous glory by replanting the Chardonnay vines one section at a time. By 1979 the vintage had achieved the quality Krug was aiming for and was therefore the first vintage of the Krug Clos du Mesnil. Only about 12,000 bottles of this wine are made in only the top vintages. 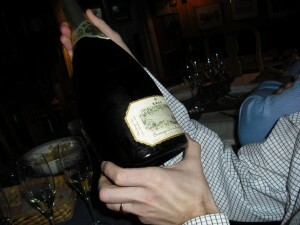 Even less bottles are produced in the desireable Magnum size. Tasting this Champagne was a rare and most likely once in a lifetime opportunity for me. One I am very grateful for. Let’s talk vintage for starters. 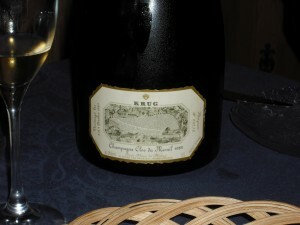 The 1985 vintage in Champagne was considered an excellent vintage. Perhaps the best vintage of the 1980’s. 1985 started with the worst frost the residents of Champagne had seen in over 150 years. In January, the temperature outside reached a low of -25 Celsius (-13 Fahrenheit)! At this point, the vines were still hibernating, so no damage done. However, by the time the vines had awoken it was still -15 Celsius (5 Fahrenheit) outside resulting in around 10% of the vineyards freezing. Even into April, outside temperatures were below freezing. 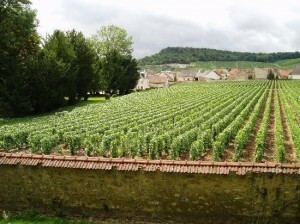 Thankfully, the weather changed substantially as the vines flowered and temperatures in August and September were hot. Thanks to the long Indian Summer, harvest was in late September resulting in a small harvest of very concentrated grapes. The wines made from this vintage are still quite youthful and can rest a few more years down in the cellar. Appearance: Slight development showing. Slightly darkened color, but not much. Fine and elegant stream of bubbles with a delicate mousse. Nose: Fresh lemons with hints of mushrooms and truffle with overlaying minerality. Hints of toasted wood. Palate: Very minerally with bright lemon fruit. Awesome acidity and length. Some toasty bread notes and hints of oak, but only hints. I call this the sleeping giant. I don’t think that this wine fully opened this evening. We were a group of around 10 which meant that the Champagne was drunk up too quickly for it to come around. It was elegant, acidic and fresh, but not what I expected from this great wine. According to a reputable source, the 75cl bottled scored 98 points with a drinking window of between 2007 and 2020. Since Magnums (150cl) bottles are deemed by many to have superior aging potential (they age more slowly), I would imagine that perhaps this bottle was not quite ready and nowhere near its peak. I look forward to the next time we meet then. If there is a next time!